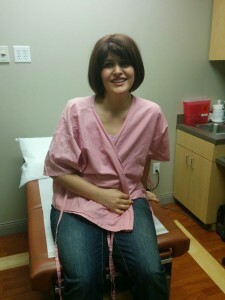 Fargam chose and did bilateral mastectomy surgery a few weeks ago. The good news is that her test results showed that she got rid of cancer! She had a pathological complete response and now she is on the path to wellness. However, two weeks after the surgery she had to be hospitalized for three days due to her shortness of breath and heart palpitation, but now she is doing better and better each day… Also, in the following 6 months, she will undergo several (at least 2 and probably 3 or more) reconstructive surgeries. As you may already know, our lovely friend Fargam just celebrated her 34th birthday and was recently diagnosed with breast cancer. In this difficult time of her life, we want to work together and help her. She’s been a blessing to so many and we hope to be her blessing during this very difficult time in her life. For those of you who may not yet know her, we would like to share her story with you in hopes that you too will help us take a stand beside her during this battle. Fargam closely experienced a war during 8 years of her childhood and was injured. She lost many of her childhood friends and witnessed many horrible things. Including having to endure the loss of her teenage brother. The excruciating pain and anguish due to her experiences and loss became her inspiration. She was determined to find a way to change the world and make it a better place for all of us. And she was going to take her beloved dog “Puppy” along with her on her journey! She decided to pursue a PhD in Ecology. She focused on how to improve our environment, manage our natural resources, and protect human health. After achieving her bachelor’s degree she began pursuing her masters degree and joined the Swedish University of Agricultural Sciences. While there she contributed to Amnesty International and the care of animals at animal shelter. Once she obtained her masters degree she and puppy began pursuit of her PhD here in the US. Meanwhile she began teaching courses at the University of South Florida during the spring semester in hopes of helping others to pursue and achieve their goals. Being a person of humanitarian effort whom loves all God’s creations, Fargam is loved by many. She has always been first in line to volunteer in helping others during their time of need. She is a beautiful, kind hearted, loyal and dedicated person. She loves animals and always takes time to reach out and help with placement or treatment of them when possible. Soon she adopted “Nisha” from Florida Cocker Spaniel Rescue shelter. Recently, Fargam received another devastating blow discovering that she herself has breast cancer. Within the past couple of months she has undergone several minor surgeries. She also went through her second chemotherapy session last week. It is expected for her treatment and recovery to at least a year and she has been forced to quit her job because of the demanding treatment. The medical care expenses and having no wage during this period is a huge financial burden for her. The financial stress and depression she is suffering on top of everything else is overwhelming her. Therefore we decided to raise funds for her. She has done so much for so many and now we want to lighten the burden for her in this financial situation. But this can’t happen without your help. We know that some of her friends and family have already generously donated either time or money to help her out. In addition to what has already been donated, this organized donation site will benefit her directly, to assist her with her expenses during this terrible ordeal. There is power in numbers and only with your help and prayers can we make this happen! If you would like to stand with Fargam and show your appreciation, love and support for her during this very difficult time please join us! Also know that no donation is too small and every contribution helps and is appreciated enormously. All donations are tax deductible. We thank you very much for taking the time to read this message, and we want you to know, in advance, how much we appreciate your support. Please feel free to share this with anyone that you think may be willing to contribute. عضوی از ما (فرگام نینوایی)، در حال جنگ با سرطان است. آن هم، کسی که تمام دوران کودکی اش در خوزستان ودر قلب جنگ سپری شد. آن چنان که نه تنها روحش بلکه جسمش نیز از فاجعه جنگ ایران و عراق بی نصیب نبود. در حالی که پس از اقامت در کشورهای مختلف هنوز بلاتکلیف در آمریکا به سر می برد، این بار با هیولای سرطان دست و پنجه نرم می کند. گرچه همه ما قادر نیستیم که در این دوران سخت در کنار او باشیم، ولی می توانیم با دعا و شاید کمک های مالی خود قدری از بار مخارج مداوایش را به دوش بکشیم. بیایید دست به دست هم داده، در این سختی با او شریک شویم. لطفاً این مطلب را با دیگران نیز در میان بگذارید.